Determined and focussed Sharin has fought her way through trauma and hardship to reach new goals and help herself and others. The 36-year-old mother and wife was brought up the youngest in a family of eight children in a small town in Bangladesh and came to the UK to settle and start a family with her husband. But Sharin’s life has had some hefty bumps along the way. Her happy childhood with seven siblings and loving parents took a very sad turn, when she lost her father aged just eight. Finding her groove again at age 10, Sharin received three scholarships and took pride and joy in her studies. She dreamt of becoming a teacher or a doctor, but money was tight. Determined not to stop learning, Sharin continued with general studies. At the age of 21, Sharin got married to a supportive and loving man, who lived in the UK. But more trouble brewed as their applications for Sharin to join her new husband in the UK got refused continuously. For five long years, Sharin had to show her strength, be patient and try to deal with the frustrations of not being able to be with her husband. Being a determined character, Sharin didn’t let the wait stop her studies. During the long separation from her husband, she managed to finish her Masters degree and had a plan B, to keep her focused. When she finally arrived in the UK she found lots of support from her husband and even though the new way of life was a completely different from everything she knew in Bangladesh, she was keen to settle into life here. But it was not easy. Everything seemed very expensive, the different weather was very difficult to deal with and wearing wintry clothes was very uncomfortable. Naturally, after such a long wait, Sharin was also keen to have a family. But once again, she had a tough task on her hands. Suffering three miscarriages Sharin was left feeling very low for a long time. But after so much heartache, Sharin and her husband finally had a daughter five years ago to complete their little family unit. Sharin lovingly brought up her baby girl and found herself with time on her hands, when her daughter started school last year. Over the last six months, Sharin’s life has become very busy. 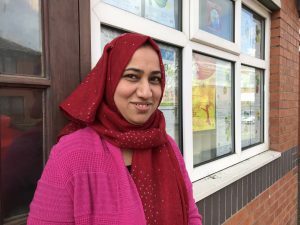 With her little girl in school, she started to volunteer to improve her English and she took on three courses at the adult community centre in Ashton. Sharin joined a unique project at Diversity Matters. The Graphic Lives project, which was run in collaboration with Manchester Metropolitan University, helped Sharin and a dozen other local women get new skills and gain confidence. The project took Sharin to new parts of the North West and gave her the opportunity to teach and present to 15 students at the University of Manchester. There seems to be no stopping Sharin now. One day a week she has been volunteering at The Helping Hands charity shop, and she has found lots of support and help at Diversity Matters, where she comes in to volunteer regularly as well. Her own strength and determination has helped her take on completely different and challenging tasks and with the encouragement and guidance from Diversity Matters, Sharin has now also got herself a job and a driving license. Not surprisingly, with her willpower, she landed the job after completing her very first interview and got her driving license on the first attempt too. She is now working part time as a care assistant around Hyde using her license to get her around. So Sharin’s life is very busy now. She has no days off because she works for four days caring for the elderly, and the other three days of the week she’s still busying herself doing her courses. On top of that, whenever there is an opportunity to do other things, she still volunteers too. Sharin recognises her own strength and knows that without it, she might not be where she is today. She is driven by a strong urge to help people and wakes up in the morning longing to reach out and help others. She sees herself as committed and focused and believes that it’s important to try, try and try again. She believes that nothing is impossible for a strong person. Her new job as a care assistant lets her support others in their time of need and she is always helping friends and family too, because she believes that her purpose in life is to be used for good. She has bounced back from hardship and she feels that she is comfortable in her life now. But she still sees others suffer and this drives her to help. With her new job, she now also has plans to donate some of her earnings to people in Bangladesh, who have very little. Since leaving Bangladesh eight years ago, Sharin has only been able to go back to visit her big family in Bangladesh once. But she is very fortunate to have an older sister in London who is very supportive and always helps her. Her sister has been a great source of inspiration and support and along with her helpful and caring husband, is a source of constant inspiration for Sharin. With her strength and determination to overcome life’s up’s and down’s, Sharin helself is a great source of inspiration for others too.